Windows 10 is about universal apps, and getting everything on all your devices. That includes the new Xbox app, which you'll find on PC, Xbox, and mobile. 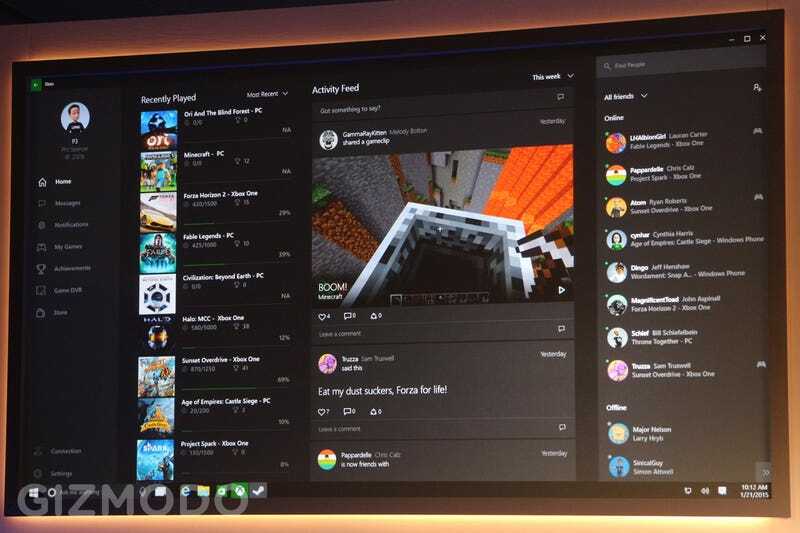 It'll let you text and chat and do everything you love on Xbox Live across every Windows device you have. The biggest and best news? It'll let you stream your Xbox One games to any Windows 10 device. It's not just that though. You know all that cool Game DVR stuff the Xbox One can do? Well the Xbox app can do it too, and it'll work for any game running on Windows. This isn't suddenly a competitor to Twitch or anything; just like on the Xbox, you can use all of this to stream games out to the Amazon-owned service. It is however pretty similar to some of the stuff Nvidia is doing with its GeForce Experience and ShadowPlay features—although those require you to have an Nvidia card. The new cross-platform app will also make it easier to play games with your friends no matter what device you're on. Fable Legends—presumably the first of many—will be launching on both Windows 10 and Xbox One and will allow for cross-play between PCs and Xboxes. The Xbox App and cross platform games are only the begging though; the Xbox One will be getting Windows 10 proper, which means it'll be getting support for alllllll those universal apps that work across your tablet and your phone and your PC too. Excel on the TV? Youbetcha.